On February 15, the Cincinnati Museum Center will open its doors to a groundbreaking exhibit of ancient Egyptian artifacts. “Egypt: The Time of Pharaohs” features more than 350 unique artifacts and various interactive displays, taking visitors on an in-depth tour of life in ancient Egypt and the Nile River valley. This is the exhibit’s first appearance in the United States and features never before seen artifacts on loan from partnering institutions. The sprawling 15,000-square-foot exhibit takes visitors through an immersive experience of the lives of ancient Egyptians — from queen to commoner. On view are artifacts of personal and public import, from jewelry to burial tombs and religious items. Through educational displays, visitors will learn about such things as religious ceremonies, the complex irrigation systems along the Nile, and the architectural designs of ancient pyramids. “Egypt: The Time of Pharaohs” is the work of Museumspartner, an Austrian company that produces and installs large traveling exhibits worldwide. It is a cooperation between Museumspartner, the exhibition center Lockschuppen in Rosenheim, Germany, and the Roemer and Pelizaeus Museum in Hildesheim, Germany. The main artifact lenders are the University of Aberdeen and the Roemer and Pelizaeus Museum. The exhibition first opened in Rosenheim in 2017; it was most recently shown at the Royal BC Museum in Victoria, Canada. This will be its premier showing in the United States. Regine Schulz is the general director of the Roemer and Pelizaeus Museum in Hildesheim and Professor of Egyptology at Munich University. She has helped curate the exhibit and thinks it is a fine presentation of the broad diversity of life in ancient Egypt. “The exhibition combines, in an excellent way, great works of art with objects of daily life and impressive models of temples and palaces,” she says. To illustrate the distinct and elaborate burial practices of ancient Egyptians and their obsession with the afterlife, various artifacts on display speak to the secret spaces of the dead. Some highlights include the coffin of Nakht, a roll of papyrus with scenes from the Book of the Dead, and the overseer of the granary. The mummy of Ta-khar, an elderly woman from Thebes in Upper Egypt, is on display. The design of her coffin mimics a palace made to last into eternity, and her mummy was elaborately embalmed and well preserved. In addition to the ancient artifacts, the exhibition also features more than 20 interactive media stations including a visual tour of built-to-scale replicas of ancient temples. In another station, visitors will find an innovative 3D hologram of a mummy of an ancient woman named Takheru. In this first experience of its kind, the image can be viewed from every angle in a true-to-life experience of seeing inside the mummy. “The story of the lady Takheru is very interesting,” Schulz says. As for Schulz, her favorite artifact in the exhibit isn’t a large centerpiece — it’s a small bronze figure of a shrew with representations of the winged sun god on its back. The artifacts and media displays of “Egypt: The Time of Pharaohs” tell a compelling story of life in one of the most famed civilizations of the ancient world. People in the western world have always been fascinated by ancient Egyptian culture, but there are still many mysteries and misconceptions about its history. 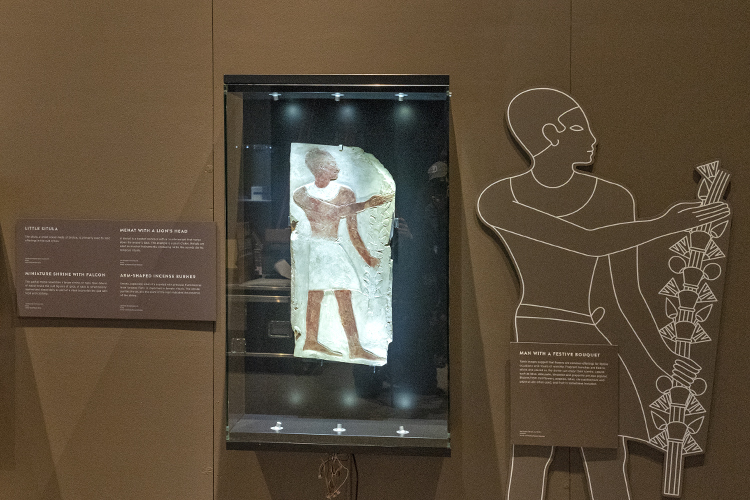 This exhibit may help expose some of the more common aspects of Egyptian life, bringing history to life in a way that’s more accessible and familiar than far-off stories of temples and kings. The exhibit reaches beyond the pharaohs and elite society into the life of more common residents and workers. The multitude of architectural achievements, refined aesthetics, and skillful artistry of ancient Egypt will all be on display and the sheer quantity and diversity of the artifacts is impressive. “We cannot believe how much [has] been preserved from antiquity until today,” Schulz says. Egypt: The Time of Pharaohs opens to the public on Saturday, February 15, 2019. Tickets range from $8.50-$12.50 for members, $12.50-$19.50 for non-members and can be purchased at the box office or online at the Cincinnati Museum Center’s website. As a compliment to the Egypt exhibit, the film Mummies: Secrets of the Pharaohs will be playing in the neighboring Richard D. Lindner Family OMNIMAX theatre. The film follows scientists who have used mummy DNA and ancient artifacts to learn more about modern medicine and genetics. Tickets are between $5-$9.